This unusual character was the brain child of Paul Haynes, owner and director of Tax Time Services of Oakville, Ontario. It was conceived as a serial to be published quarterly. The suggested selling price was $4 Canadian, and it was intended to be sold through stores, and indeed was sold through at least one store. None of this went any further, and the first issue became the only issue. The Art Editor and colourist for the cover was Wayne Gilbert who taught in the Sheridan College. He was also a water colourist, worked on independent films and directed the International Summer School of Animation. The cartoonists Ted Collyer and Terry Rottsaert were third year students in animation program. The story was released during the run up to the introduction of the General Sales Tax (GST) which commenced 1 Jan. The Minister of Finance who transformed into “The Grabber” and his assistant “Claw” created the G.S.T. 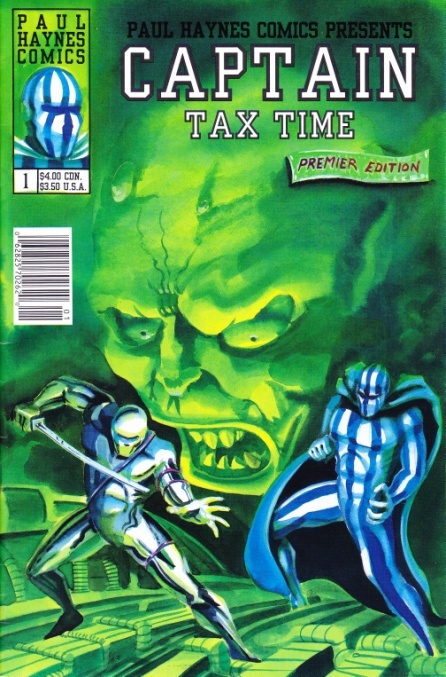 Captain Tax Time whose base in hidden among the glaciers in the arctic and his ally “Sergeant Saver” fought this scheme by attacking the criminal element, drug lords, crooked corporations and criminal king- pins. It turned out that “The Grabber” and the criminal element were allied. The confrontation occurred at their headquarters from which, after a battle our tax fighting duo took $30 billion dollars and presented it to Parliament making the G.S.T. unnecessary. However, “The Grabber” transformed into “The Enforcer” and here was sent the stage for a serial which did not occur. Captain Tax Time. Car., Ted Collyer & Terry Rotsaert. Writ. Assist., Paul Haynes. Cov. Colo., Wayne Gilbert. Ed., Paul Haynes & Wayne Gilbert. Paul Haynes Comics, Sept. 1990.